Senate Majority Leader Mitch McConnell (R-KY) thumped Speaker-Designate Nancy Pelosi Wednesday night from the Senate Floor. 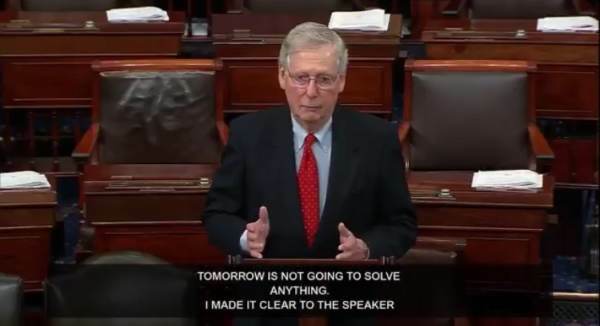 McConnell said the Senate won’t even consider legislation passed by the House Democrats this week because it won’t include border wall funding. “As I’ve said consistently for the last two weeks, the Senate will not waste its time considering a Democratic bill which cannot pass this chamber and which the President will not sign,” McConnell said. Earlier Wednesday Chuck and Nancy emerged from the meeting with President Trump at the White House vowing to pass bills that will re-open the government and stiff the President on border wall funding. “Tomorrow we will bring to the floor legislation that will open up government. It will be based on actions taken by the Republican Senate,” Pelosi said. McConnell also announced the Senate reached an agreement to confirm more of Trump’s judicial nominees.